Tucked away in the Queen's Collection at Hampton Court is a most curious and delightful portrait. Once a great jewel in the Royal Collection, it now occupies a place of relative obscurity, relegated to being described as the work of a Raphael follower. However, there is much more to this picture. John Shearman, one of the most prominent Raphael scholars of the last century describes the portrait's history as one of the "oddest" in the Royal collection. Much of the discussion about subject and author of this piece revolves around the inscription seen on the buttons on close examination - where the words RAFFAELLO and VRBINVS are inscribed on the left and right buttons respectively. Earlier commentators believed these to be later additions, but later microscopic analysis revealed otherwise, leading Shearman to more confidently pronounce this piece as a Raphael original. Presence of extensive underdrawing and pentimenti also suggest the work is not a copy. Presented as a Raphael self-portrait to King George III in 1781, it was examined, catalogued and shifted in the 18th and 19th centuries. 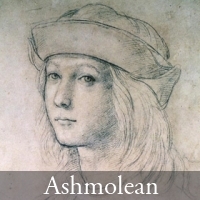 Giovanni Cavalcaselle, co-author of one of the earliest comprehensive Raphael catalogues saw the picture in 1854 and made extensive sketches and notes. He was even noted to jot down the exclamation "brillante-Raf" (brilliant Raphael) when he beheld it. Yet when Cavalcaselle came to describe this work in the volume co-written with J.A Crowe - he was less convinced. The reasons for this change of heart are not entirely clear. One possibility was the subsequent claim by Royal catalogue author E. Law that the button inscriptions were a later addition. What can be said with certainty is that this negative attribution persisted for the greater part of a century. It was only in the 1950s that Italian art historian, Carlo Volpe began to rehabilitate this piece - publishing papers which explored the painting's iconography. Volpe related this to Raphael's exposure to Venetian Scholar Pietro Bembo, highlighting the use of iconographic features from a Memling piece that was known to be in Venice and that Bembo could have described to Raphael during their contact in Urbino. Another youthful portrait now in Munich was also cited by Volpe as a Raphael self-portrait, but I will save that for another post. Despite the iconographic and scientific clarifications, the Royal Collection is still somewhat aloof in their estimation of this piece - with a very ambivalent entry in their own 2007 catalogue. Part of this may have to do with the controversy ascribed to the Madonna of The Pinks, which flared up when James Beck's Connoisseurship in Crisis was published in 2006. It could be argued that the overseers of the Royal Collection were being cautious not to attract attention towards a 'possible' Raphael of their own so soon after the Pinks scandal. Shearman believed this painting depicts Raphael at a stage between the face of the youth in a fragmentary drawing in the British Museum and the established self-portrait seen in the School of Athens. 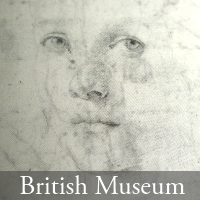 It is also worth noting that the more famous adolescent drawing in the Ashmolean Museum is presently less accepted as a self-portrait, with the focus of the pupils, and facial features being cited as key factors. Described in a 1631 list of items to be transferred to the Medici Collection in Florence. Shearman noted however that after this date the work does not appear in any inventory of the Medici Collection. It is possible the work entered another private collection in Florence at some point in time before it was acquired by Lord Cowper in the 1780s, though no documentation to support this is presently known. Presented to King George III by 3rd Earl of Cowper as a Raphael self-portrait. The 1780 Cowper letter highlights a sale price, though later commentators note it was gifted to the King by Cowper(Faulkner). It is possible these later commentators were not aware of the correspondence between Cowper and George III. 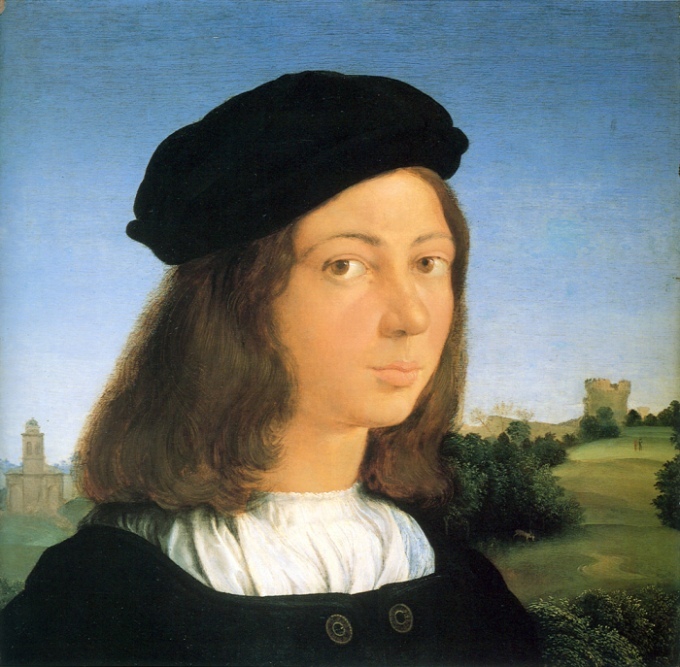 The sitter bears a resemblance to other Raphael portraits, depicting the artist at a younger age. nb. 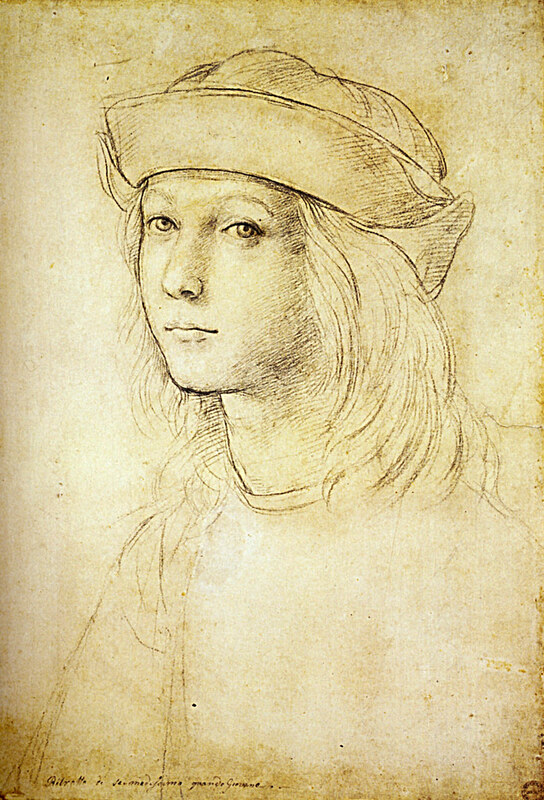 Raphael would have been 22-23 years of age at the estimated date of this work. The black garment meeting at the middle with two buttons has been identified as a doublet. Doublet buttons contain the words: RAFFAELLO and VRBINVS on the Left and Right sides respectively. Commentators have noted the stag in the background. This is also present in another alleged self-portrait in the Alte Pinakothek, Munich. 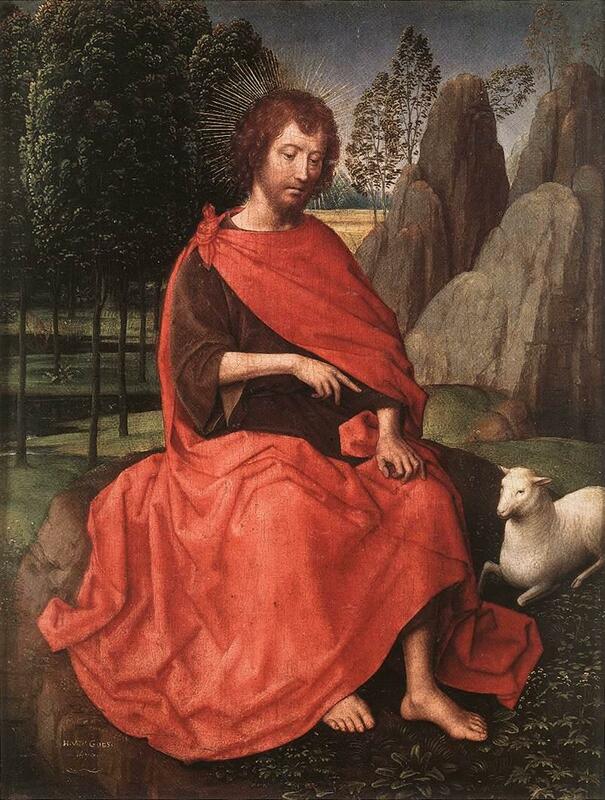 It is argued this is a direct quote of a motif used in Memling's Saint John from the Diptych of Saint John and Veronica, now split between Munich and Washington respectively. It is mentioned that Raphael may have known of this motif via Venetian scholar Pietro Bembo (noted to be in Urbino in 1505 and 1506). 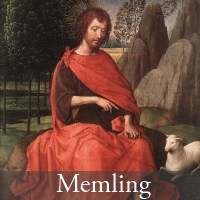 This Memling piece having been reported to have been in the collection of Bernardo Bembo in 1502. Poplar - dating evidence on this wood has not been presented. Dating evidence for the panel may localise it to a relevant time period, but will not be conclusive of Raphael's authorship. It is also unclear whether the nature of the panel has been established via microscopy or visual analysis alone. Panel is noted to have a slight convex warp but with 'negligible' disruption of the painted surface. Panel exhibits signs of being cut along bottom edge and behind, with signs of worm holes indicating the likely reason this was done. Top edge is still original and shows strip of unpainted white ground of approx. 1.2cm thickness, other sides are cut. The lower edge cut is reported by Shearman as uneven, with an 8mm discrepancy from L to R.
Infrared Reflectography revealed, "an underdrawing of remarkable strength and decision, but one which is nonetheless different from all the others I have seen". This statement by Shearman in the Princeton Symposium volume perhaps needs some qualifying in that it may be more useful to compare this self-portrait with the underdrawings of other alleged self-portraits, such as the other youthful depiction in Munich, the more well-known Uffizi version. 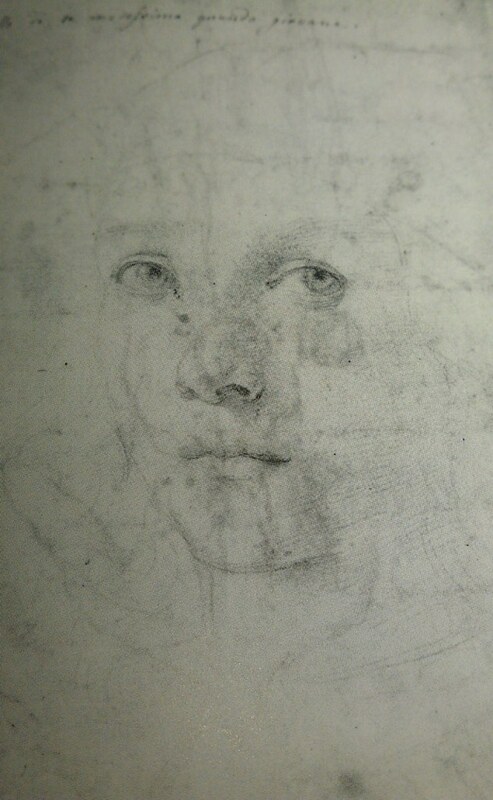 IR Reflectography of the Uffizi version (itself under an attribution cloud) also demonstrated an extensive underdrawing. *Church on left hand side once had a conical/pedimented top. Microscopic analysis revealed the yellow pigment of the buttons inscription to be continuous with preceding layers, suggesting it was not a later addition(as others have proposed). Purchased as a Raphael self-portrait by 3rd Earl of Cowper and admitted to the Royal Collection in 1781. Passavant viewed it in a repainted state in 1831, who asserted that it was by Raphael, but representing another sitter. Passavant, Ruland and others were convinced of the paintings authenticity, leading until the 1850s when it was viewed by Cavalacasselle, who made detailed (extant) sketches and annotations of the piece. Whilst initially in favour of it, subsequent publication of the Raphael monograph along with J.A. Crowe listed this picture as a by a follower or Raphael. Similar negative sentiments were also expressed by Morelli. Law and Oppe, also described the doublet inscription as a forgery - subsequently contradicted by microscopic analysis demonstrating it was applied at the same time as the original paint layer. This Portrait of a man has been accepted by some art historians as by Raphael, but has also been considered to be the work of one of Raphael’s Florentine disciples. More recently it has been accepted as a self-portrait, painted around 1505-6 in Urbino, whilst others have rejected this attribution. Two questions remain open: is this of Raphael and is it by Raphael? That the portrait is by Raphael must be a judgement based on quality and comparisons ; that it is of Raphael may be argued first from the evidence of the inscription, and second from the convincing place it holds in the sparse sequence of Raphael self-portraits. A more detailed mode of scanning, with comparative analysis of physical and technical characteristics with known Raphael pieces of the early 16th Century may allow a more definitive assay of the authenticity of this piece. Faulkner, T. History and Acquisitions of Kensington. 1820. Law, E. A Historical Catalogue of the Pictures in the Royal Collection at Hampton Court. 1881. Item. 710. Shearman, J. Raphael in Early Modern Sources 1483-1602. Yale University Press. New Haven and London 2003. Volpe, C. Due questioni raffaellesche. Paragone. Vol 7, No. 75. 1956. p.3. Whitaker, L., Clayton, M. The Art of Italy in the Royal Collection: Renaissance and Baroque. 2007. Royal Collection Enterprises. London. 2007. pp.42-46. You have been busy! I find it interesting that a balance of questionable Raphael work is housed in Britain. From the Madonna of the Pinks to this Young Raphael piece, seems there is a bit of missing history, probably in an ancient private library somewhere. Perhaps one day that area in question will be filled in by some lucky researcher. Always enjoy reading your most excellent and informative posts! Cheers Mary Jo. If you are in UK and ever visit Hampton, keep an eye out for it! That was my main intention in writing this post - just to let people know its there. Raphael or not, it's quite charming. I agree: very nice painting, whoever painted it! Does the literature on the work have anything to say about the intriguing architecture behind the sitter? Are these references to Urbino? Do you know of any symbolism behind the striking church / castle combination? I look forward to finding out more about your exciting Raphael project! Cheers for the comments Vicky and Ben! @Ben - In his sketches, Cavalcaselle seemed to think the fortification on the right was the tomb of Caecelia Metella - a Roman patrician woman and daughter-in-law of the famously rich Crassus - that was later converted into a fortification. Neither commentator seems to have identified the church on the left - Shearman did say it is of 'imaginative' design. Raphael's fascination with Roman architecture came later, so it is an unusual point - and something which more commonly appeared in later periods - eg. a famous portait of Goethe also has it in the background! This is why the panel being more accurately dated would dispel some of the fog around the era of this work, let alone its author. Very interesting! I'm also intrigued that the church, especially that it changed from a conical/pedimental shape. I wonder if this painting has ever been on loan for an exhibition. Are you familiar with any such loan? I especially curious if it has appeared in any exhibitions that highlight the work of Raphael. Though perhaps pieces from the Royal Collection are not given much opportunity to travel? Hi M! The Shearman reference for the Queen's collection lists only one exhibition date - in 1946 at the Royal Academy - where it was listed as 'Umbrian School 1520' - ie. not as a Raphael.